Sing Da Marine Structure Corporation (SDMS) has been awarded a multimillion dollar contract to construct the jacket foundations for Ørsted’s 900MW Greater Changhua offshore wind project off Taiwan. 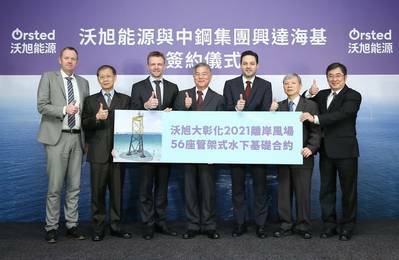 During 2020 and 2021 SDMS will supply 56 jacket foundations for Ørsted’s first 900MW Greater Changhua projects to be installed in 2021. The deal is reportedly Ørsted’s largest jacket foundation contract ever, as well as the largest of its kind in the global offshore wind industry. SDMS, a wholly-owned subsidiary of integrated steel maker China Steel Corporation (CSC), will extend its facilities in Sing Da Harbor in Kaohsiung specifically for the project and have the new factory operational in the first quarter of 2020. Matthias Bausenwein, Ørsted’s President for Asia Pacific, said, “Foundations are an essential part of building offshore wind power plants in Taiwan, not least due to the extraordinary demanding site conditions in the Taiwan strait. For our Greater Changhua projects, we will have to use Jacket foundations, weighing over 1,100 ton and reaching a height of approximately 75 meters. Such large structures will require outstanding fabrication performance as well as excellence in the execution phase during installation. The contract remains subject to certain conditions such as the signing of a power purchase agreement by the end 2018 and Ørsted’s final investment decision, which is expected in March 2019.